Rub the chicken breasts with olive oil and place them on a baking sheet. Sprinkle generously with salt and pepper. Roast the chicken for 35 to 40 minutes, until just cooked. Let cool slightly. Separate the meat from the bones and skin and cut into 3/4-inch chunks. Add to the chili and simmer, uncovered, for another 20 minutes. Serve with the toppings, or refrigerate and reheat gently before serving. Per Serving (excluding unknown items): 109 Calories; 5g Fat (38.6% calories from fat); 2g Protein; 16g Carbohydrate; 3g Dietary Fiber; 0mg Cholesterol; 637mg Sodium. Exchanges: 0 Grain(Starch); 0 Lean Meat; 2 1/2 Vegetable; 1 Fat. ***My notes: I forego the oven and cook the chicken in the pot first with a small spritz of olive oil (barely any ~ just enough to brown the chicken). 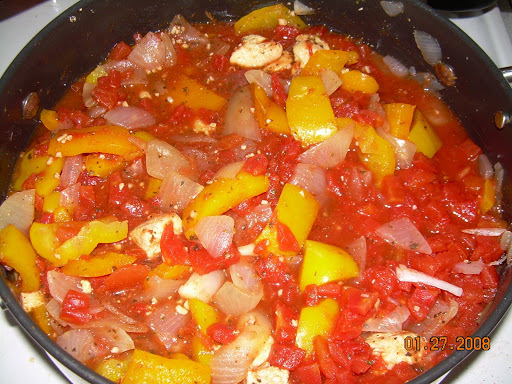 I then add the rest of the ingredients (yellow & orange peppers instead of red, because I figure there’s enough red from the tomatoes) and let it slow cook all day long. This is very yummy and I serve it with green onions, lowfat sour cream, and lowfat cheddar cheese.